TFCC problems can be caused by a fall on an outstretched hand (a "FOOSH") or simply degeneration from overuse or the aging process. Athletes, particularly gymnasts who bare weight on their hands, are especially prone to TFCC problems Sometimes misdiagnosed as a “wrist sprain,” proper diagnosis is crucial to treatment. The most common symptoms of a TFCC problem are wrist pain on the ulna side of the wrist with a clicking or popping sound when moving the wrist or rotating the forearm. 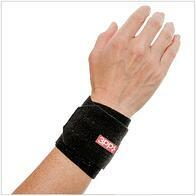 Wrist pain is generally felt when gripping tightly or when pushing on the hand to rise up from a chair. TFCC problems can be very persistent. In most cases, TFCC tears are managed with anti-inflammatories and splinting for about four weeks followed by corticosteroid injections if necessary. After splinting the wrist for a period of time to reduce symptoms, range of motion exercises can be recommended to restore motion and strengthening. 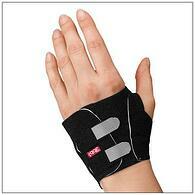 There are a few splints specifically designed to address TFCC problems. The 3pp Carpal Lift reduces wrist pain and popping by supporting the ulnar carpal bones to realign the wrist and relieve stress on the TFCC. A pad cushions the palm of the hand, while two straps lift the carpal bones into place. This splint, which can be easily strapped on with one hand, may be worn during activity and is recommended for incomplete tears to allow healing and when surgery is not needed or is delayed. The 3pp Wrist POP Splint applies adjustable compression over the distal ulna and a counterpoint of pressure under the distal radius for stability and effective treatment of TFCC injuries.ulnar-sided wrist pain, and distal radioulnar joint (DRUJ) instability. The corrective strap and pressure pads allow the user to position force across the distal ulna and radius to restore stability for pain-free supination/ pronation and wrist motion. Foam-lined base sleeve will not slip or roll and allows the corrective strap to be attached wherever it's needed. Conservative treatment plans are often successful, especially for the most common type of tears that generally do not involve fractures and are not destabilizing to the distal radius ulnar joint (DRUJ).